It has happened. I’ve gone over to the University of Connecticut ‘Hungry Husky’ dark side. There will be those who attribute my slide from smiling Husky grace to the dual national basketball championships won by my alma mater UConn, men’s and women’s basketball teams. Not so. It happened before. I drove out to the UConn Co-op to purchase some reporter’s notepads and there it was – a beautiful white, half zip, lightweight, soft fleece sweatshirt calling my name – and sporting the new fierce faced Husky logo. In a moment of weakness or joy, maybe a little of both – I tried it on and I fell in love with it. Yikes! 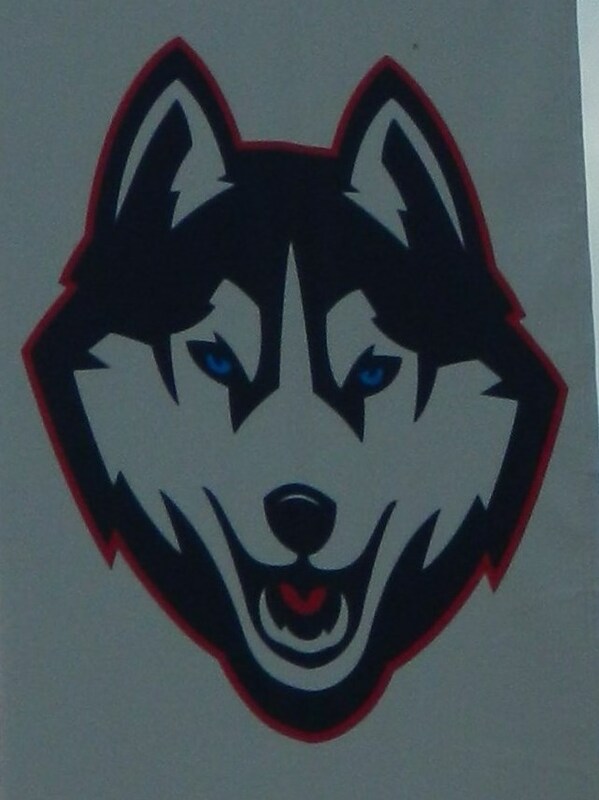 After the change from a friendly UConn Husky mascot logo to what was first described by detractors as a mean faced Husky, then softened by spinmeisters to fierce faced and now has evolved to “Hungry Husky”, I predicted this day would come. See “Say It Isn’t So – Friendly UConn Husky Mascot to Go” posted March 19, 2013 on newsandviewsjb. Nonetheless, the idea of joining the fierce faced Husky fray pained me slightly and I passed up the shirt with the new logo. Truth be told, however, I’ve been thinking about it. I have imagined wearing it with dark, straight leg jeans or a new pair of beige, chino Bermuda shorts – or maybe walking the beach in the evening up on the Cape this summer with it slung over my shoulders. And now I know, it’ s just a matter of time. I will return to Storrs, and if it is still there, we will be reunited – on the dark side of Hillside Road.